In February of this year, we drove a yellow school bus from our friend Simon's farm in Uxbridge down to a completely empty 2,000 square foot warehouse in Toronto. What followed was the most amazing, tremendous outpouring of community support and help we have ever seen. 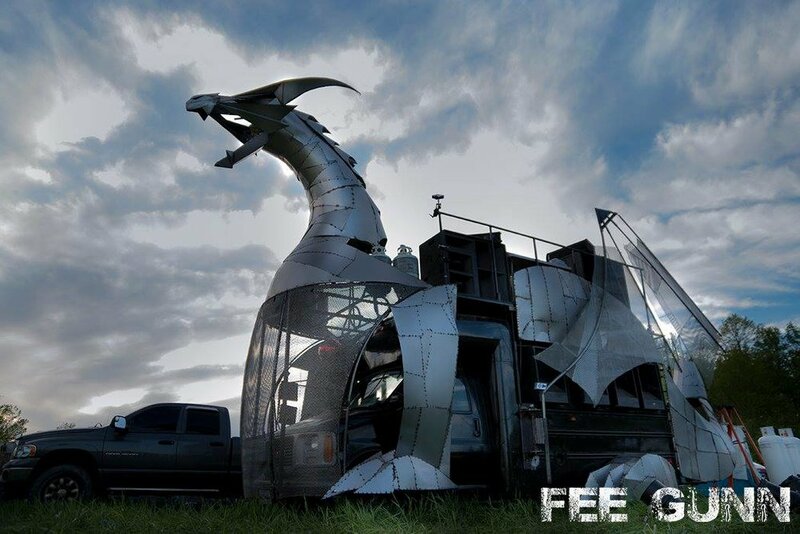 Every day from 1 PM to 10 PM, seven days a week for four months, we, along with a team of anywhere from 5 - 20 people per day would weld, cut, and grind steel until this yellow school bus became a 30 foot-long fire-breathing dragon. In 2018, we are implementing massive upgrades to the dragon, from fully articulating wings, to a fully pivoting head, to a new LED lighting system. Buy tickets to WHITEOUT, January 26th to help make it happen! Or invite your friends on Facebook. 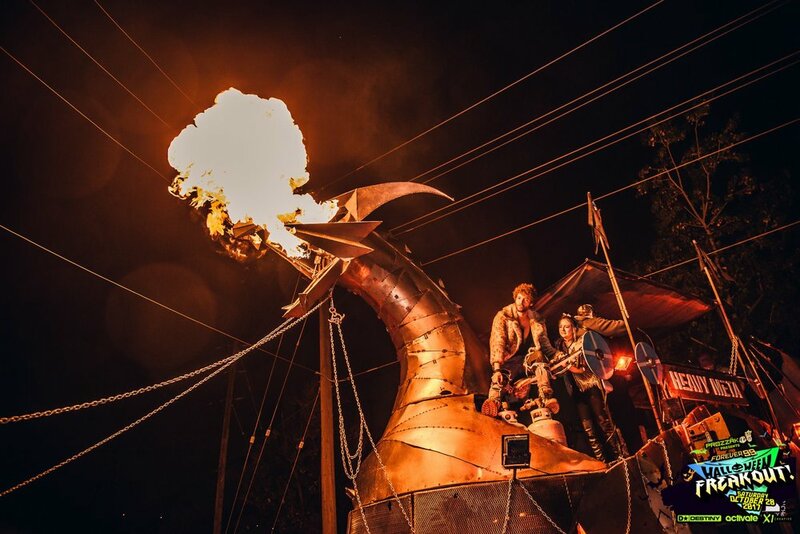 Many people think we built the dragon for Burning Man, but that is only a tiny part of the picture. We built it for every other event, too. And to that end, in the latter six months of the year we took the dragon to fourteen different events! Hyperborea is Ontario's newest, greatest regional burn and they were the first people who believed in us, funded us, and invited us to their event. We are amazed at how much the community stepped up, from half a dozen work weekends building infrastructure, to all the great art, to the smiling faces in the pouring rain still dancing anyway. We can't wait to see you all there next year. Ever After is Kitchener's annual EDM fest. We rented a house in kitchener from a fellow burner, 20 vikings used this space as a home base for a 3 days of fun. We learned what it takes to pass a T.S.S.A. inspection and partied with 40 000 bass hungry hang bangers. Lakes of Fire is the Great Lakes region regional burn, and it was awesome! We have been hearing about this event in Western Michigan for years and were so grateful to have been partially funded by Great Lakes Experimental Arts and invited to the event. 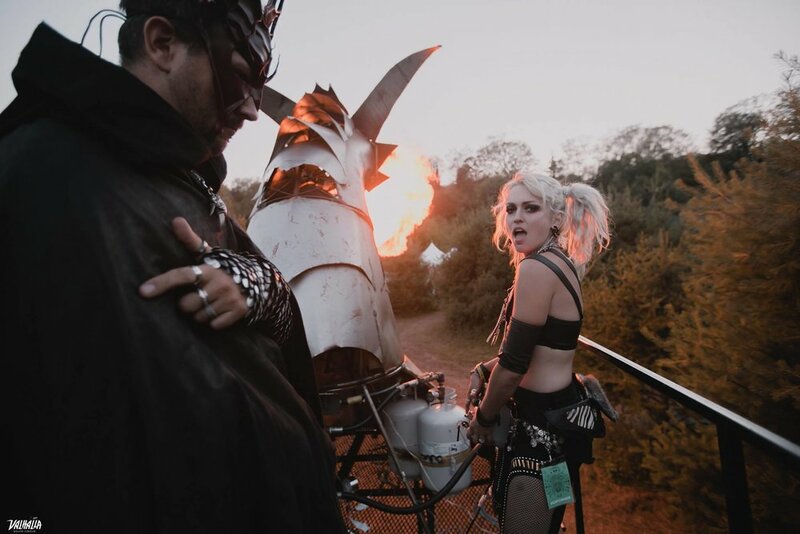 This was also the first event that let us drive around, shoot fire, and play music all at the same time, just like we intended <3 Can't wait for next year! One of our Indiegogo perks was a private party anywhere in Ontario, and we were thrilled when a friend of a friend ended up booking us for a block party on her cute street in Forest Hill. Thank you Shuna! Our first Maker Faire! 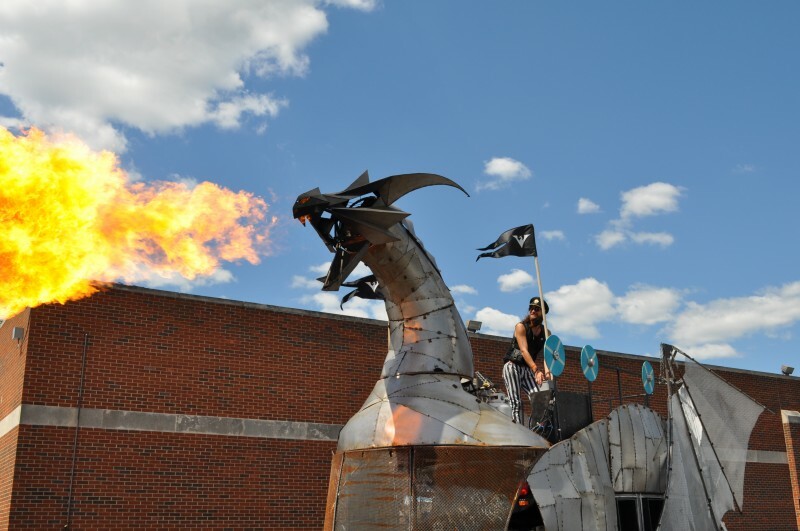 Maker Faires have become some of our favourite events that we do because it gets the dragon in front of a whole different crowd who don't usually get to see fire art, metal art, or our unique blend of insanity. Valhalla is like the Shambhala of eastern Canada: bass music on an awesome piece of land for three days with a great, tight-knit community. We will be there next year too! Our first public event in Toronto was an amazing, viking-filled outdoor day party in the Junction with the dragon, food trucks, our own bar, and hundreds of our friends. Can't wait to use this lot next year! Elements is an amazing transformation of an old portland warehouse in the Bronx featuring DJs like GRiZ, Pretty Lights, Damian Lazarus, and Jazzy Jeff. We were pleased to be the fire stage of the elements, as well as pass our first New York City Fire inspection! World Maker Faire, otherwise known as "the greatest show and tell on earth," was the largest public event we have been part of. Featuring incredibly talented makers from all over the Northeast, and all over the world, we greeted people as the first thing you would see walking into the event. We also had an amazing stay in a new hotel in Flushing with an insane sushi buffet! Fun fact: we try to find all-you-can-eat seafood buffets in every city we go to, the cheaper the better! Pittsburgh Mini Maker Faire at the Children's Museum was an amazing three days of showing off the dragon to schools and the public in western PA. We loved seeing the different reactions from kids of all ages. Freakout was our chance to be the drum n bass stage at a Destiny Party, whom we have loved and respected for a long time. We hosted the prolific producer Culture Shock on the dragon, along with a whole host of Toronto's favourite DNB DJs and MCs. Cleveland Mini Maker Faire was an adorable one-day event at the Cleveland Public Library. 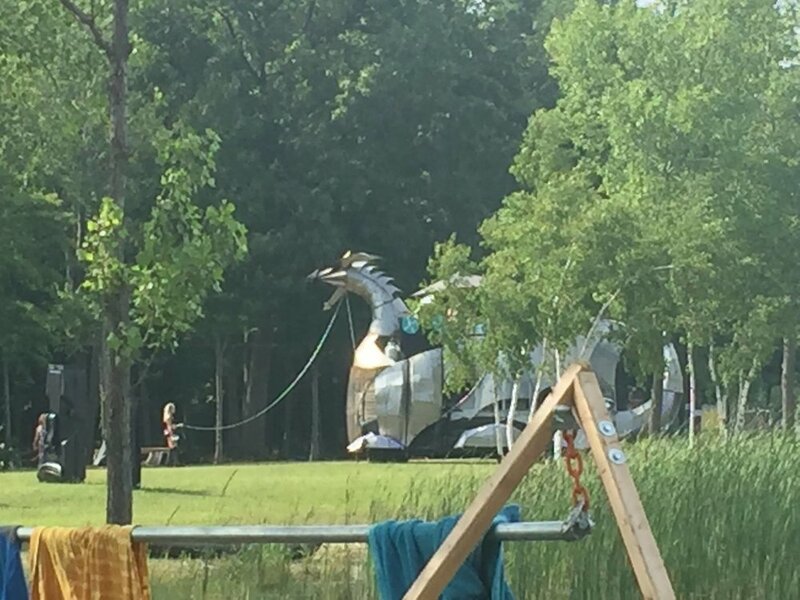 Highlights include a trebuchet battle with water balloons, staged sword fights by medieval enthusiasts in front of the dragon, and lip syncing in robes at the Hyatt during down time. Our final event of the year was in our favourite city in Western New York, where we have many dear friends. The faire itself was a great event, filled with tons of awesome stuff! Later on we got to check out a cool cocktail bar and goth club in Rochester, what a trip! 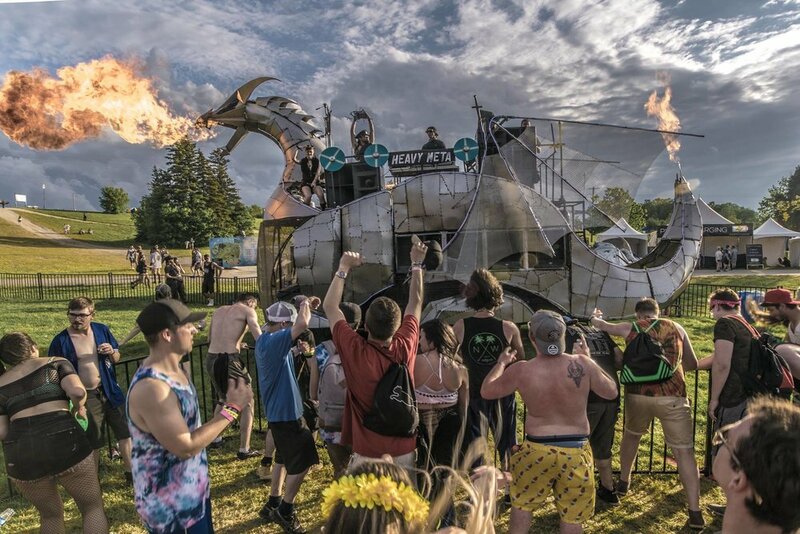 There is no amount of gratitude we could express here that would adequately express how floored we were to receive the help and support of the group of 100+ volunteers who touched the dragon in some way in 2017. We promise to keep bringing the fire for years to come in our home city of Toronto and abroad. We hope you will join us!